Since it launched in 2016, Facebook Live has grown significantly from a fun tool, to a serious brand marketing tool. There has been over 3.5 billion Live videos created by millions of people around the world, engaging tons of people who watch! As we know, engagement is key in the business-social media world. Likes, views and follows are not as important. Even if you have even a small audience watching you, as long as they are engaged and consuming your content, they are all you need to start! And more engagement not only indicates a better response from fans, but also boosts your content in the Facebook algorithm. Facebook Live videos are winning right now in the Real Estate industry. Everywhere you look, there are either Facebook or Instagram stories from Real Estate Agents posting to their profiles, engaging tons of clients or prospects. Facebook Live is definitely worth it, and everything you need to know about using it for Real Estate, is right here! Facebook Live is a feature for the live broadcast of user videos from the Facebook mobile app. This allows Facebook users to broadcast live video of themselves to their friends and followers. This tool is great for Real Estate Agents looking to connect more with their social media followers and give them a quick update on the market, show what houses you are selling (even do a mini tour!) or even just to say hi. Launching a Facebook Live video is different, depending on whether you’re using a personal profile or a Facebook Page, if you don’t know the difference, check out our blog! The easiest way to get started is create a Facebook Live video directly from your mobile device. That’s right! As long as you have the Facebook app downloaded onto your phone, you can easily create them from anywhere! Plan to watch it. Not everyone is on Facebook waiting for you to do a Facebook Live video! After you have pre-planned what your Facebook Live video is going to be about, and you have let people know on social media that you will be creating one, it's time to actually start you Facebook Live video! 1. Download and Open the Facebook App for your mobile device. Using your mobile device is easier than using your computer. This makes it easier for you to do Facebook Live videos at anytime, anywhere! 2. From your Newsfeed, Tap “Write Something” or “What’s On Your Mind”. They depend on if you are creating a Facebook Live video from your business page or your personal profile. This is where you would write/share a post. For us, it says “Write Something”. 3. From the Bottom, Select “Live Video”. 5. Add details: Tap the location icon to tag your location if appropriate and tap the Face Icon if you want to add more information about what you’re doing. 6. Tap “Start Live Video”. And there you have it! Your Facebook Live Video for Real Estate Agents. Plan Your Facebook Live Video. Tell Your Followers in Advance. Double Check Your Internet Connection. Whether you are using internet connection or data on your phone, make sure you can keep the Facebook Live video going! Engage With Your Audience. If people start liking or commenting on your Facebook Live video, shout them out! Let them know that you see it. If they comment a question, make sure you answer it. Q&A’s. People have questions. Facebook Live is awesome for being able to communicate right in the Live video so you can answer right away. Mini Real Estate Listing Tours. Like we said earlier, take your cell phone with you! When you’re heading to a listing, create a Facebook Live video about the new listing as well as a little tour. Market Updates. This is one many Real Estate Agents have been doing with Facebook Live. Once a week/month, take a couple minutes and do a Facebook Live on the Real Estate Market. Personal Videos. People want to know you. Get some videos of you outside of your Real Estate life! Contests. Run some Facebook Live contests! People love them and will increase your engagement significantly. Behind the Scenes. Where are you headed? A new listing? Meeting a new client? Let us know! Remember, people won’t be watching right away. You have to plan and acknowledge people coming in, halfway or even near the end of your Facebook Live. We know you can do it. The main thing to take out of this, is to have fun! There’s no secret to doing it perfectly. Every Real Estate Agent is different and has their own unique way of doing Facebook Live videos, so make it your own! If you’re a Real Estate Agent who uses Facebook Live videos, let us know what works well for you! Facebook has become the most powerful and effective social media platform that businesses can use to advertise on. This is because of how specifically advertisers can target potential customers and potential leads, as well as the information that Facebook ads can collect from them. But a lot of business owners are not sure how to track the ROI of Facebook Ads. To help you with that question, here are some trackable ways to measure the ROI of your Facebook ads! Before you even start with a Facebook ad campaign, you have to make sure that you have created a custom URL for your website. A good one to use is Google’s URL creator. When creating an ad in Facebook Manager, you choose a marketing objective, traffic, target audience, the placement of your ads, the budget and a schedule. After, you are to choose a page that you want to promote this ad under, the format, and the custom URL that you have made. This URL will incorporate all the parts of your campaign. When you have put in your URL, put in “Facebook” for Facebook ads. This is where you enter in what metric you want to use for the ads: Clicks or impressions. Clicks are where you only get charged if someone clicks on your ad. Impressions are the number of views that your ad has had, and you pay for each person that has viewed it. If you use Wix, you can use Integration or Tag Manager, but if you’re comfortable copy and pasting the code, do it. To paste the code, make sure that is is placed before the end of your end </head> tag. Once you have the code placed, Facebook will let you know if it has been put in properly or not. Next, click “Create Conversion” to allow Facebook traffic to connect with a certain action on your website (view website, sales, download etc.). Now that you have created the custom URLs to track visits from potential leads to your page, and a conversion pixel to track the actions made on that page, measuring ROI for your Facebook ads is easy! Look at what it costs for your ads for the last 30 days. Then compare it to the sales/leads that were generated from the conversion action in the same 30 days. Compare these numbers. Are you making a ROI on your Facebook ads? You need to make sure that you set a goal ROI that you want to generate, even if the outcomes are not positive, using Facebook ads is NOT a waste of your time! Need Some New Accounting Marketing Ideas? Use Facebook Lead Generation Ads! Most accountants or accounting firms are looking for a new idea or a way to boost business from their marketing. So if you’re here looking for an answer, you’re not the only one! Most of the time, you are probably wondering about what new methods or social platforms you can use to engage your target market and receive new leads that will actually take action. What if you could collect information from targeted leads from people without requiring them to leave the social platform they are using? Yes. It’s possible with Facebook Lead Generation Ads! Facebook Lead Generation Ads are great because they allow leads to see a highly-targeted ad without the ad being “intrusive” to their social media platform because it blends in with what they are already seeing on their Facebook feed. These Ads collect information from a potential lead when they click on your ad when the ad switches to what is called a “Lead Form”. This is where they fill out their name, number, email (etc.) which then goes straight into your CRM so you may follow up with. From here, go to the Power Editor or Ads Manager for your business page. The latter is probably the one you’ll use if you’re just starting out on this. So let’s go forward as if we’re using Ads Manager. You need some creative images or videos that you can use for your ads. After you have finished the setup process, you will need to go into your “Ads Manager” for your Business Page. Click on “Create Ad” and then choose “Lead Generation”. Name your campaign. From here you need to fill in the actually account information for accounting marketing, not for the ads. These include currency, country, time zone (etc.). Now we can get to the exciting part of your accounting marketing, we can create a target audience and ads! 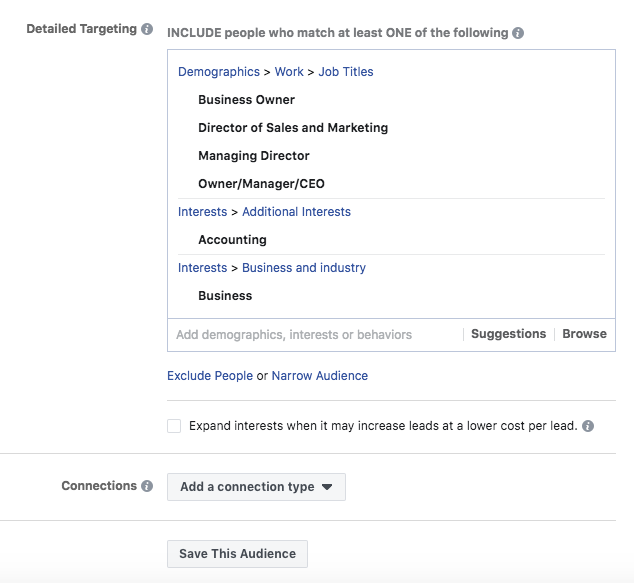 When you are creating Facebook Lead Generation Ads, you can create (more than one) specific and defined target audiences. These target audiences that you create are the only ones who will be seeing your ads. When going through the target audiences, pick through age, gender, income, profession, interests, demographics and more! Here you can also set your ad budget daily/lifetime. This where you are creating the actual creative ads for your accounting marketing. These are just what the ad will look like to potential leads. The best ones to use for accounting marketing are a Single Image or a Single Video. These are the best ones because they capture attention the most with who you will be targeting. The Carousel Ad and Slideshow are not formats that people will engage with (Unless you are in the retail industry). Choose photos and videos that are engaging. These include high-quality images as well as high-quality sound if Single Video is the format you are choosing. There is nothing worse than anding on an ad that has terrible video quality. I sounds awful and will not get you the results you want! Customize your headline, text and CTA (call to action). Make sure the person who sees your ad will easily understand what it is about, and what happens when they click on it. When making your Facebook Lead Generation Ad, you will be asked to choose a “Call to Action” button like “Learn More”, “Call Now”, “Book Now” and more. There are many to choose from that you can connect anything to (website, files, etc.). In the “Questions” tab, you will be asked to choose what information you want to collect from your leads. For example, the email, name, number (etc.) that we talked about earlier. Try and keep these questions simple and and minimum. No one likes filling out a form. Think if it more as a “Can I just grab a few things” instead of “Fill this out”. It makes it easier for your lead AND for you. If you don’t need the information, don’t ask. Finally, customize a thank you page and insert your chosen link. Always double check your whole campaign before you publish it. When you’re satisfied with your Facebook Ad, publish it! Not Sure How to Run Your Retail Business On Facebook? Here Are A Few Tips! Marketing your retail business can look complicated and full of work. But using Facebook for your business is SO much easier than it seems. So I've provided some useful tips to get you started using Facebook for your retail business! Is Your Facebook A Business Page or a Personal Profile? If you have a retail business, you need to have a Facebook Page. This is where your customers can follow your business’ updates and photos about your products. It is important that when creating that Facebook Page, you are not using a Facebook Profile instead. While creating content or promoting products on Facebook for your retail business, always remember who you are speaking to. For example, if you are a clothing brand whose target market is teenagers and sells teenage clothing styles, you want to post and promote content that is young and fun, not corporate-like and dry. Overall, you want to make sure what you are posting onto your Facebook is connecting by being relatable with your target audience. So many clothing brands post a photo with “Model 4,356 from our Fall Collection.” You have to make your retail business fun, creative and most importantly, engaging! Make sure you change up the types of content you share as well. This could include a mix of photos, videos, shared photos from customers, and more. Like I said earlier, get creative! Everyone loves saving money. So use Facebook to promote your product with sales, coupons and discounts. Some great ways to do this are coupons, seasonal sales on product, engaging contests, promo codes and discounts of a certain percentage off certain product. Another awesome way that retail businesses can promote these promotions through Facebook, is utilizing your Facebook Business Page and creating Facebook advertisements. 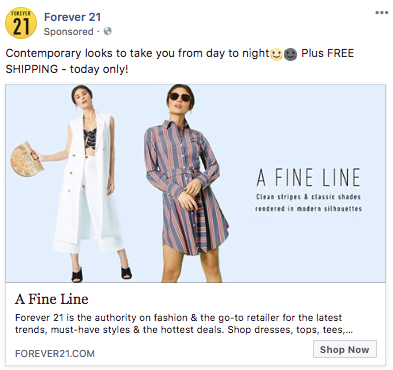 Forever21, a clothing retail company, created this ad recently on Facebook to promote their “FREE Shipping” for that specific day only. When using Facebook Ads Manager, you can create targeted advertisements to your customers to let them know about current or upcoming deals and offers for your products. Simple Facebook posts about what is left in stock can be very smart. It lures people into your store and website to shop when they are hit with scarcity. It creates an urgency that they need to product NOW or they won’t be able to buy it later, or until more come in, before someone else buys them. Overall, make your retail business stand out on Facebook, and have fun!